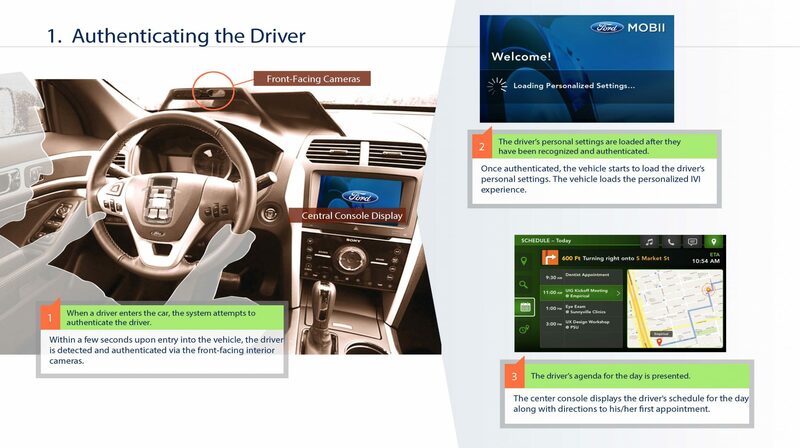 A joint project between Ford and Intel, called Mobile Interior Imaging or Project Mobii, is determining how vehicles can use interior-facing cameras to create a more enjoyable and intuitive driving experience. Among the avenues being explored are facial recognition software that create greater security and the possibility of an app that allows for a remote check of the vehicle’s interior and grants access to other drivers. The concept of using facial recognition to grant drivers access to a vehicle is a long-held staple of science fiction, but Project Mobii seeks to determine the viability of the technology for future mass production. According to Ford, a driver is authenticated by Project Mobii through a front-facing camera (presumably somewhere in the dashboard). This not only allows for customized settings for different drivers—up to and including calendar, music, and contacts—but it also has the potential to eliminate the possibility of vehicle theft. If a driver’s face is unrecognizable, a photo depicting the person attempting to use the car is sent to the vehicle owner’s smartphone, where they can set permissions and disable features. This also allows parents to create restrictions for their teen drivers, from electronically limiting the speed to limiting audio volume. Project Mobii is also investigating the practicality of using gesture recognition for tasks such as adjusting climate control settings and opening and closing windows.